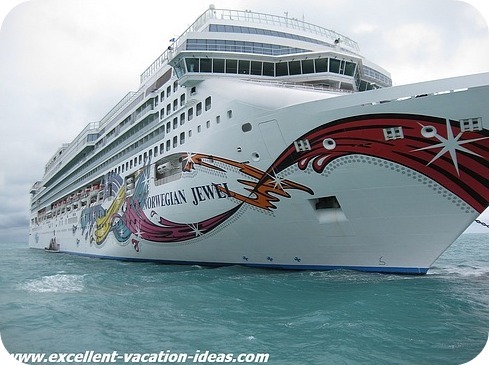 Norwegian Jewel - Norwegian Cruise Lines "Jewel" of a ship! We sailed on the Norwegian Jewel recently. I could give you all of the facts and figures about the Jewel, however I know that you can find that info anywhere. When we are looking for information on a cruise ship, we want to know how people enjoyed the ship, see lots of pictures and find out any tips that will make the trip go even smoother. We really enjoyed our time on the Norwegian Jewel cruise ship. We always enjoy this size of ship and freestyle cruises. We also enjoy and only stay in the suite level cabins, which no doubt enhances and even made our vacation as great as it was. Previously as a couple, we have sailed on the Norwegian Dawn Cruise Ship (in an Owners Suite), the Pride of Hawaii on our Hawaii adventure (in a penthouse suite), the NCL Gem (in a balcony cabin as it was a 2 day cruise to nowhere) the NCL Jade (2 week Europe and Egypt cruise in an Owners Suite) and this time we chose a Courtyard Villa as we wanted the extra cabin for Montana. This was a trip for her spring break and her first cruise on NCL. We chose to take a Norwegian Cruise Lines cruise in July of 2006, back when I was tired of "traditional cruising". I had always felt rushed and was sick of being on a schedule. I also always felt like we were running from activity to activity or "missing out" on something on other cruise lines. Then Warren found NCL and the suites and villas and that was it, we were hooked. Just to let you know we aren't sun worshippers (although Montana wishes we were at times). We like to relax, have good food and service, good entertainment, great ports to visit and of course, visit the casino. The NCL ships make this work for us better than any other cruise line. The Norwegian Jewel is a sister ship to the Norwegian Jade, so the layout was familiar to us and we knew what to expect. At 93,502 gross tons, we find that she is just the right size. It doesn't take forever to walk from place to place and there are about 2,400 passengers on board. There were signs at every elevator as to where every place was that you wanted to go to. 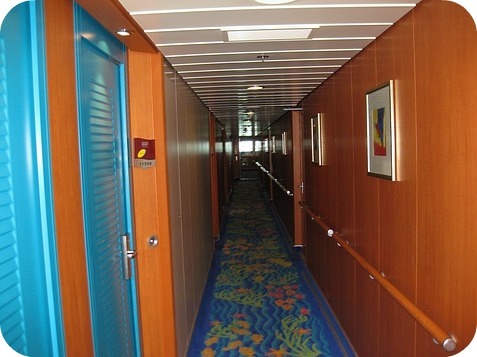 Also follow the fish on the carpet in the hallways to determine if you are going forward or aft on the ship. We loved that the Courtyard Villa's were close to pretty much everything. We just had to zip down to Cagney's or the Garden Cafe for breakfast. The design just makes sense to us. The common rooms were large enough, and we never felt like we couldn't find a seat (except by the pool on sea days). The bar area on deck 6 was good for watching the games (March Madness was on) and was a great meeting area. The casino was pleasantly laid out and the smoke didn't seem as bad as it does on other ships. 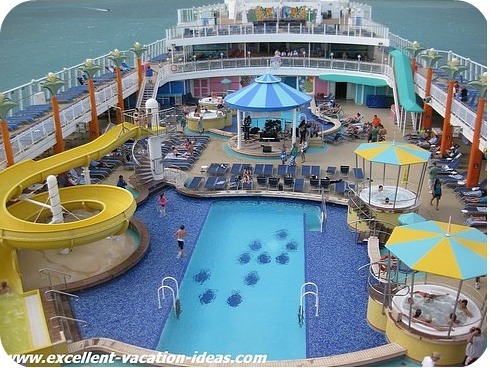 The pool area on the Norwegian Jewel is well laid out and has an adult pool and a family pool (the family pool has the slide). Montana and I watched a few of the pool games here, and Montana had a blast at the Caribbean pool party here one evening. Both of the pools were salt water. We didn't spend a lot of time in or by the pool as it got quite busy (especially on sea days). We also had the courtyard pool that we could use. The hot tubs always seemed to be in use, even in the evening. In fact many times they were so busy that people would sit on the side and try to dangle just one foot in it. Regardless, it always looked like people were having a great time. There were plenty of bar waiters around to order a drink, and the hamburger grill was always stocked (and smelled great) over lunch or around 3-4 pm on port days for those that were hungry after a great day ashore. Make sure you try the hot dogs - there were amazing! Probably the main reason that we started sailing with NCL. 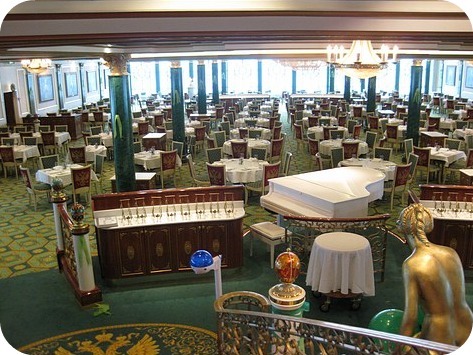 Freestyle dining is our favorite way of dining on a cruise ship. You have choice. You can go one of the main dining rooms - Tsars Palace or Azura, or make a reservation at one of the many specialty restaurants. 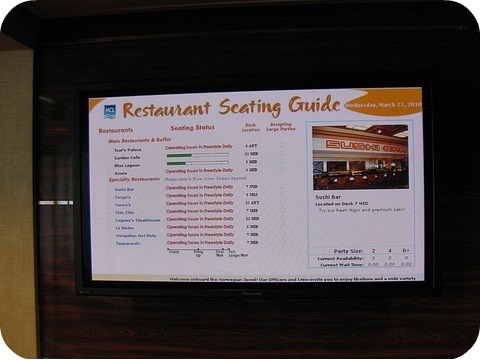 You could also check the restaurant screens and drop in one of the specialty restaurants if they aren't busy. Just like restaurants on land. 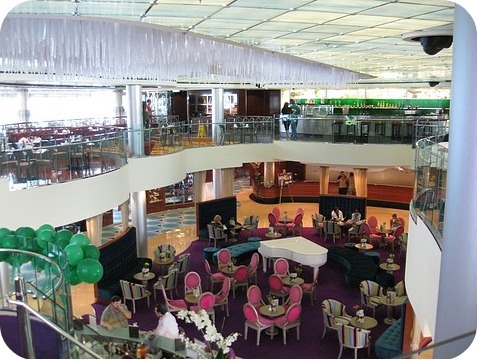 We love that the many restaurants are located in different areas of the ship. It allows for a different view and experience with each meal. We prefer the extra charge restaurants on the Norwegian Jewel as we find the food better and the atmosphere more intimate. Teppanyaki - food is amazing and it's a lot of fun too! The Courtyard Villas and the Courtyard itself, really contributes to why we love Norwegian Cruise Lines. Not only do the villas and suites offer larger cabins, they also have access to the Concierge, a butler and some have access to the Courtyard. A private area where guests can enjoy a quiet and beautiful place to relax, or socialize together. In the courtyard there is a hot tub, small fitness area, small pool, dining area, lots of chaises and free water, coffee and tea, and treats all day long. Then you can walk upstairs and enjoy the private sun deck. On the Jewel it was extremely large and comfortable. Here is a video showing our Courtyard Villa 14012 and some photos of the courtyard. 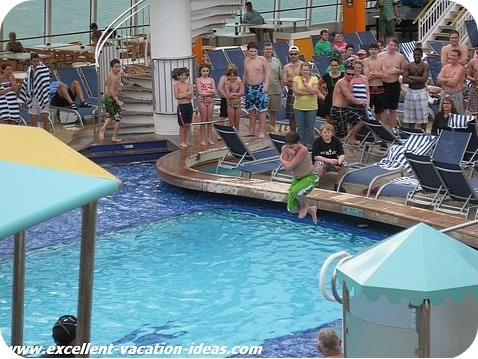 The entertainment on the Norwegian Jewel is known to be the best in the fleet. I would have to agree with this. We aren't big "show" people but we made sure that we saw the "Band on the Run" and the Cirque Bijou show. They were fabulous. 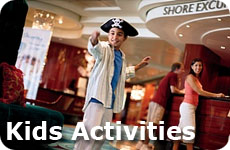 There are the traditional cruise games and game shows, and they show them the next day in your cabin. So if you missed something you can still enjoy it throughout the rest of the cruise. 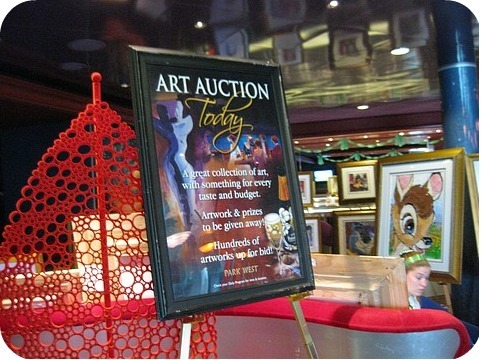 And of course the Art Auctions. I didn't find them as pushy as other cruise lines. Although we did get "VIP invites" to all of the auctions. The onboard comedian, Tim K., is really quite funny, and we couldn't get into his late night comedy show as the line up was out the door and the Spinnaker Lounge filled up quickly. So make sure you go early for this! We really enjoyed the entertainment and the cruise director's staff. People are always asking us about tips for cruising. Our number one tip is to join Cruise Critic before you go. On the boards, find the roll call for your cruise. If your group is large enough, and one of the members organizes it, NCL will put on a Cruise Critic Meet & Greet. Not only is this great as you can find out lots of information before the cruise, but you can meet people before going on the ship and then at the Cruise Critic meeting. Sometimes you even get to meet some of the officers and the captain at the meeting. We have had many other perks that we didn't expect! We had this on the Norwegian Jewel. We always fly in the night before to decompress and to ensure that if there are any problems with flights etc then we have time before the ship sets sail. Spend the extra money and stay in a suite. If you are in a suite, determine what night you want to do Teppanyaki and ask the Concierge to book it for you right away to ensure you get to do it - it is totally worth it! Don't forget the sunscreen, especially if you like to lie on one of the upper sun decks - the sun seemed stronger up there. Bring your own wine on board and pay the $15 corkage fee. This way you get the wine you like and may even save a few dollars. They will store it for you in their wine cellar and bring it to whatever restaurant you are eating in that night. Take a small carry on bag that will hold your toiletries etc for the morning of debarkation. Don't forget to keep with you your valuables and medications etc. If you have an early flight, take advantage of the "you walk your own luggage off" program. You will be the first called off of the ship. To be honest we have never found this to be helpful as the luggage is always there easily and we had VIP debarkation. All in all the Norwegian Jewel makes an Excellent Vacation Idea for families.